You may have noticed that oftentimes when I talk about my fantasy series, I simply say, “my fantasy series” or “my series in which I re-imagine Greek myths” or “my series in which I bring Greek myths to life.” Why not just say “The Osteria Chronicles” and save myself a bit of typing (although my fingers STILL stumble over the word chronicles)? I blame a literary agent. See, long ago when I thought self-publishing was the lowest route a writer could take in his or her career, I queried a fair number of agents with The Trials of Hercules (aka “Book One”). As is the norm, most didn’t even respond and those that did sent the standard, “This isn’t for us, yada yada yada.” However, one agent did respond. He said he thought the idea had potential but wasn’t interested because of the name of the series. Sigh. 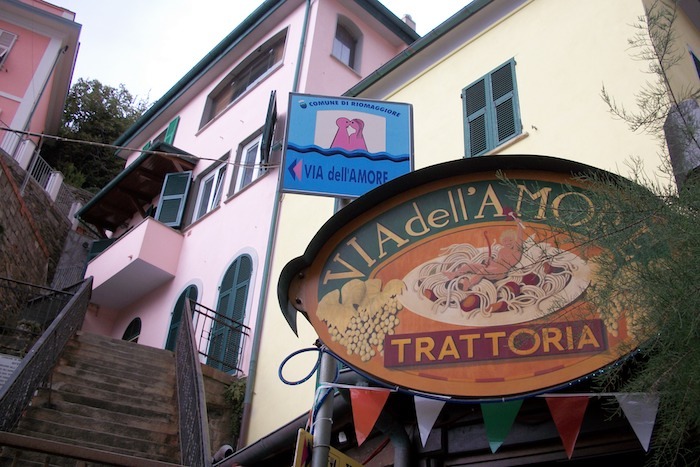 Even jet-lagged I can carry on conversations in Italian and I’ve written articles about dining in Italy for travel magazines, so I do know all about Italian pizzerias, trattorias, and, yes, even osterias. The Osteria Chronicles has nothing to do with restaurant life, but evolved from my playing around with what I should name my world. Since the series is set in a future version of the Northwest, it was tempting to call it Westeria, but that’s a bit too close to Games of Thrones’s Westeros, and I really didn’t want to seem like I’m a hack writer who is jumping on George R.R. Martin’s coattails. I then thought of Nowesteria, but look at that word. Egad!! It’s just a jumble of letters that I could see people stumbling over as they read (anyone who’s tried to read a novel with tongue-twisting names, knows exactly how halting those names can be). However, drop a couple letters from the jumble and you have Osteria, which has a nice sound and maintains the flow as you’re reading. Also, the word osteria derives from the Latin for hospitable or homey and, since my characters are going to end up fighting a battle to keep their land hospitable, I thought the name was a great fit. Annnnd, since my world has adopted many aspects of Roman culture (even though the gods have kept their Greek names), a Latin-y twist to the world’s name seemed appropriate. 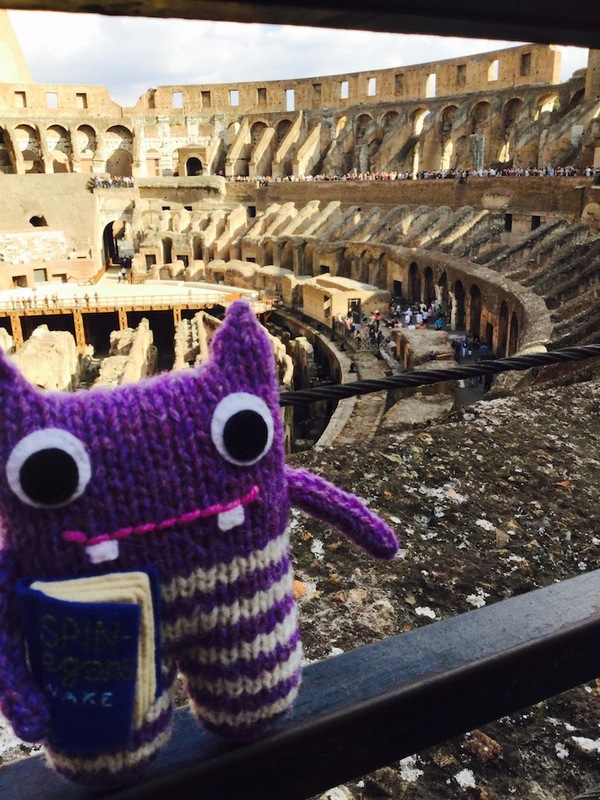 Finn McSpool on a recent “research” trip to study Ancient Roman culture. Still, the agent’s criticism (which is a fair one) has made me shy away from making regular use of the name of my world. This is something I need to get over to promote the books, but the hesitation to use it is a hard habit to break. Could I interest you in a side dish of fantasy fiction with your tagliatelle? Which leads me to wonder what the name “Osteria Chronicles” triggers (or rather triggered) when you first saw it (whether you’ve been with me for a while or whether you’ve only seen it for the first time in this post). Did you instantly think “oooh pasta!” or “hmmm, that’s vaguely Italian” or did you just glance over it without second thought? I’d love it if you dropped your thoughts/reactions in the comments section below. I just realized this morning that I’ve really never told you what inspired the series (well, I may have a LOOOONG time ago when Book One was released) or what the world of Osteria is all about, and I haven’t even told you the premise of Book Three. Silly me!!! So, as we stampede toward Release Day for The Maze: Book Three of The Osteria Chronicles, my Wednesday posts will be dedicated to introducing you a bit more to this place that is NOT a restaurant, but IS somewhere I’ll hope you’ll want to spend some time getting lost in. And of course, the next several Saturdays will be taken up with Finn McSpool’s Maui Mayhem! Be sure to follow this blog to keep up with the fun!! Have a great week, everyone! The Maze: Book Three of The Osteria Chronicles is now available for a special pre-order price of $2.99 for e-books and $10 for print books AND I’ve made it easy for you to jump into the series with discounts on the first book (The Trials of Hercules). For full details, please visit this post. Ah, that’s a relief (about the lack of pasta thoughts, not about the lack of Italian). I often wonder if I’ve been over-fretting this. Thanks for the input!! Maybe being with Mr Husband has made me think about pizza and Italian food a bit too much! Well, my knowledge of Italian is limited to swearwords and food items (thanks, Italian exchange students I met in college!) but I never heard the word “Osteria” used before I encountered your work for the first time. If anything, the name made me think of the word “austere”, which seems quite fitting for a post-apocalyptic future world… Especially given the state of Portaceae in the first book! Could it be that you’re giving this agent’s opinion more weight than it deserves because they were the only one who bothered to give you a considered response? It was decent, but it doesn’t mean they’re right! Oh no, not those stupid posters. Although maybe a nice “Hera is watching” with a picture of a harsh state would keep people from goofing off on Facebook when they’re supposed to be working. I know! Who even buys those? My dad used to subscribe to an office supplies catalogue, and one of my favourite things when a new one came in was to gaze upon the horror of a fresh batch of motivational posters. I like your Hera idea though… I’m thinking a nice Soviet-era aesthetic might work well? Overbearing bosses and mothers everywhere will love them! Nope… no thought of restaurants… I did vaguely wonder whether, had you been in the UK, whether it might have been written Oesteria. It’s the sort of thing that goes through my head! Hmmm, would that still be pronounced “Oh-steria” or would it be “Eh-steria”? No sure… it was just one of my random wonderings. It would certainly not be pronounced ‘eatery’! Funny you should ask! I am really bad about replacing proper nouns when I read in my head… so I have read ‘The Osteria’ as ‘The Oresteia’ until now! I blame my immediate jump to Aeschylus on being an actor. But (although I haven’t read it yet) I think that a mighty Greek tragedy trilogy might be an apt and not unwanted connection? I think you should definitely start embracing the word/your world you’ve created! The more you say it, the more people will associate it with your novels. I know how easy it is to let naysayers nag in the back of your mind–if you find a way to totally eradicate them, please let me know! It is starting to seem like most people aren’t making the connection between my world and a bowl of yummy yummy pasta, so maybe I’ve been letting that bit of criticism nibble at my brain too much (see, I can handle criticism, just maybe too well). Now I’m going to walk around saying “Osteria Osteria Osteria” all the time. Maybe that will cure me…or get me arrested. As someone said, there’s no such thing as bad publicity! So true. And bonus points if you shave your head like Brittany! With the state of my hair lately, it would be a vast improvement.